Hypotheses about the evolution of traits in ancient species are difficult to test, as the relevant animals have often been extinct for thousands or millions of years. In the present study, a population of physical, free-swimming robots modeled after ancient fish evolved vertebrae under selection pressures for predator avoidance and foraging ability, showing how evolutionary robotics can be used to help biologists test hypotheses about extinct animals . Millions of years ago, during the Cambrian explosion, fish started to evolve tiny proto-vertebrae on the long flexible rods (notochords) that had previously given their bodies structure and lent some stiffness to their tails. As evolutionary traits go, vertebrae were very successful: they have been preserved through these millions of years, through fish, amphibians, reptiles, birds, mammals, and eventually ended up in your backbone. So why did they evolve in the first place? One theory is that the sudden increase of genetic diversity during the Cambrian explosion led to an “arms race” between predators and prey, the prize being either dinner (in the case of the predator) or your life (in the case of the prey). Take speed as an example: as prey animals evolve faster escape maneuvers to better evade a particular predator, the predatory species will be under more selection pressure to increase its speed as well. Arms races like this could have led to innovations like vertebrae, which enable fish to displace more water with every tail movement and thus swim faster for only a small increase in energy usage. We were interested in testing how plausible it is that selection pressure for predator avoidance and foraging ability could drive the evolution of vertebrae, but unfortunately, all of the relevant animals were long extinct. Fortunately, when the desired study animals are unavailable, it’s often possible to create models of animal behavior using other animals that have some characteristics in common with the species of interest, computer simulations of the animals and their environments, or physical simulations of the animals in similar environments in order to test hypotheses like those we were interested in here. Computer simulations allow researchers to build huge populations of model organisms to which selection can be applied, but are not limited by the laws of physics. The behavior we were interested in here, which involves composite, flexible solids of varying stiffnesses bending in fluids, is difficult to accurately simulate with a computer; however, the number of generations that we wanted to be able to run to perform an evolutionary experiment would make building enough robots difficult. Rather than choose one method and be slave to its flaws, we did both: we created a physical simulation in our lab at Vassar and collaborated with two groups at Lafayette College to develop a computer simulation of the same system. If both of these simulations came up with similar results, there is stronger evidence that the results were not simply due to flaws in simulation. At Vassar, we built a predator-prey system with one predator robot that did not evolve (Tadiator) and a population of six prey robots (Preyros) upon which selection was applied. Preyro was modeled a Devonian fish called Drepanaspis gemuendenensis, a jawless fish with an armored body, two eye-spots, and a short, flapping tail. This species was likely a bottom feeder, filtering out food particles from mud. From the fossil record (top image; Viennese Natural History Museum), artist Anton Fuerst created a 3D model of this fish (bottom left image; Viennese Natural History Museum), which we brought to (artificial) life in the autonomous, free-swimming robot Preyro (bottom right image). 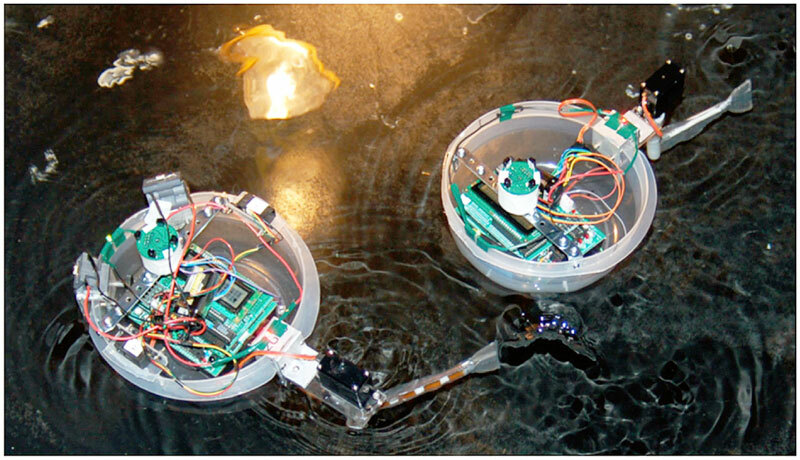 Both predator and prey robots were controlled by an autonomous on-board microcontroller and propelled by a single servo motor that flapped a submerged tail. 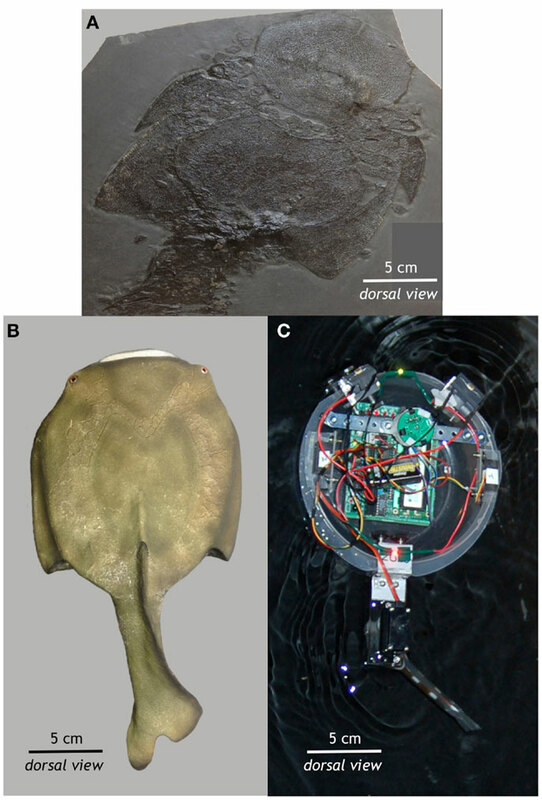 Preyro had two light sensors towards the front of its chassis, mimicking Drepanaspis’ eyespots, and two infrared emitter-receivers on its sides, mimicking a highly conserved motion sensor organ called the lateral line. Rather than eyespots and a lateral line, Tadiator had an IR receiver that was paired to an IR beacon on top of Preyro, which enabled Tadiator to constantly steer towards Preyro. The robots’ environment was a 10-foot diameter black tank in a darkened room whose only light source was a single lamp hanging close to the water. Preyro had two behaviors, foraging and fleeing, which were controlled by a simple subsumption hierarchy. For foraging, Preyro would navigate towards the light source (its “food”) by looking at the difference in light between its left and right eyespots. Preyro was stimulated to flee whenever sensing either the wall or the Tadiator close to the IR emitter-receivers on its sides, and would initiate a “c-start” startle response. 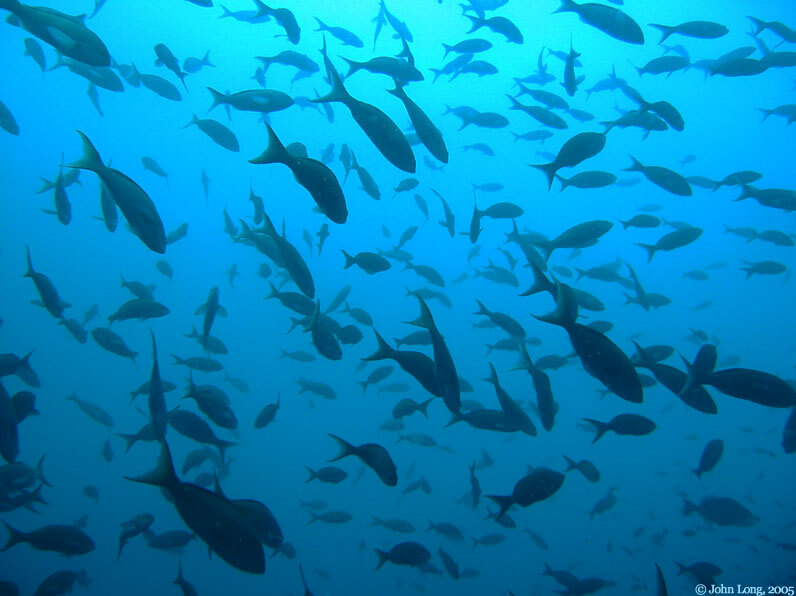 The c-start startle response is seen in all modern fishes, and very effectively moves the fish away from a potential predator. Preyro would then continue foraging as before. Tadiator had only one behavior: seek Preyro. We evolved a population of six Preyros over ten generations. Each individual Preyro was implemented on the same base Preyro hardware (same Handyboard, same motor, etc.) but with a swapped-out biomimetic tail and different code. Every individual Preyro in every generation was given three three-minute trials one-on-one with the Tadiator, where it had to forage for food while keeping safe from its predator. In a separate trial, we also measured peak acceleration during an escape attempt. We applied two selection pressures to the population of Preyros: foraging ability, as measured by the average distance between Preyro and the center of the light source over the course of three three-minute trials; and predator avoidance, as measured by average speed during a trial, average distance from the predator robot peak acceleration during a startle response, and average number of successful escapes from the predator from three trials. 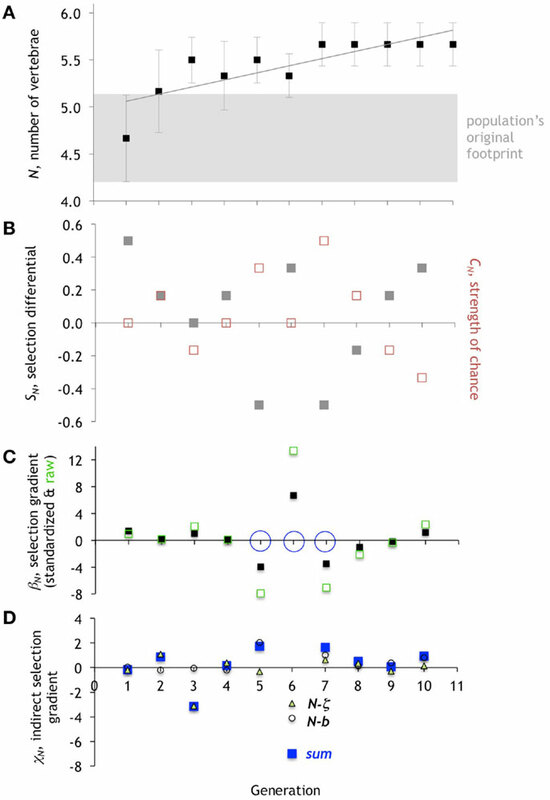 A previous experiment indicated that selection for foraging ability alone could drive the evolution of stiffer backbones, but most of the variance of the data was still unexplained. Since this previous experiment indicated that foraging ability was important but not sufficient by itself, we included it along with predator avoidance as our two selection pressures. Three character traits were allowed to evolve: the number of vertebrae, which controls the stiffness of the tail; the size of the caudal fin on the end of the tail; and the sensitivity of the lateral line. These three traits were chosen because they all appeared around the same time in evolutionary history, could be very important for foraging and fleeing, and vary greatly between species but are rarely lost completely. Individuals in each generation were ranked according to a fitness function that rewarded successful escapes and successful foraging. The top three individuals from each generation were allowed to “mate” to produce the next generation, with the best-scoring individual contributing to six individuals in the next generation, the second best contributing to four, and the third best contributing to two. Genetic information from the parent generation was “mutated” by the addition of a little random noise and then randomly recombined. This gave the number of vertebrae the opportunity to also evolve by accident. We measured the relative contributions of direct selection, chance, and indirect selection on each of these three character traits over each of the 10 generations. 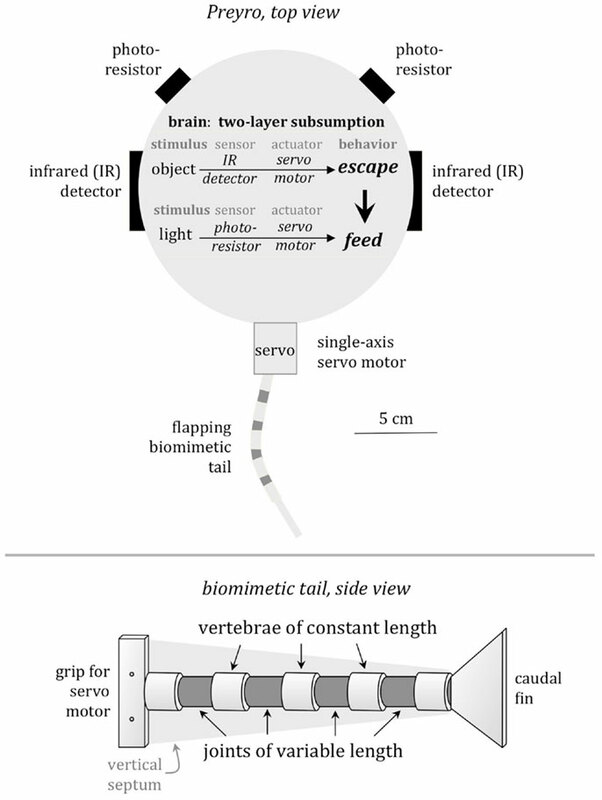 Allowing three traits to vary opened up the opportunity for the number of vertebrae to change as a by-product of trait correlation with some other trait, or for selection to act only on the caudal fin span and the predator detection threshold, indicating that number of vertebrae was not important for predator avoidance after all. An initial increase in the number of vertebrae was driven by direct selection alone, and as the average number of vertebrae in a generation leveled off at 5.7, chance and indirect selection became the primary drivers. In the last few generations, direct selection actually changed sign, indicating that the number of vertebrae had reached its local optimum. 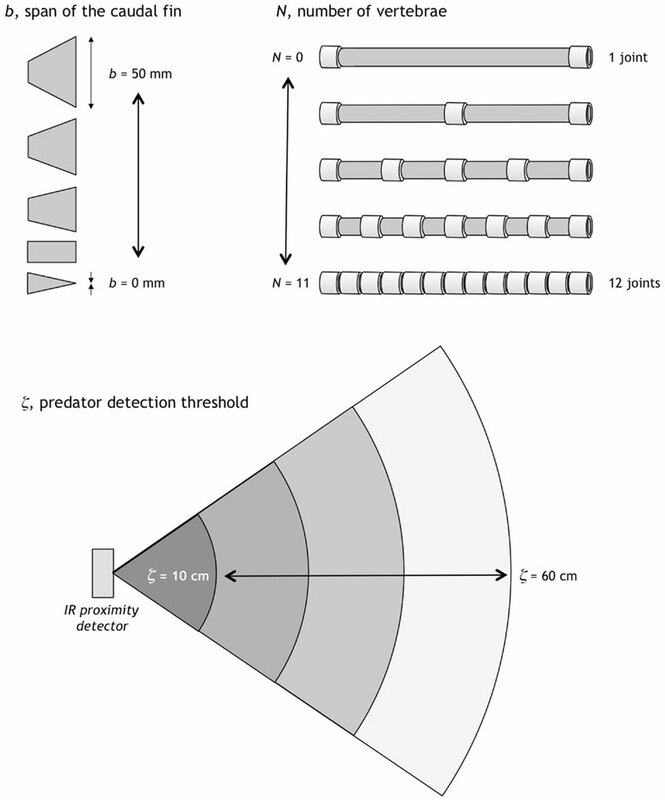 We concluded that selection for predator avoidance along with foraging could indeed have driven the evolution of vertebrae in the Devonian period, using a combination of physical and computer models of organisms to build the next best thing to a time machine so that we could study animals that had been extinct for millions of years.